except fig. 4b, which has its own (10 µm) scale bar. Figs. 1-4. Botryostrobus scalaris. BSS 21B(F) EF A18, BSS 32B(F) EF J49, IOW 140(F) and 28B(II). Fig. 5. Botryostrobus (?) sp. (no sample ID). Figs. 6-8. Botryostrobus scutum. IOW 188(F), BSW P05(F) EF S42 and BSS 61B(F) EF P42. 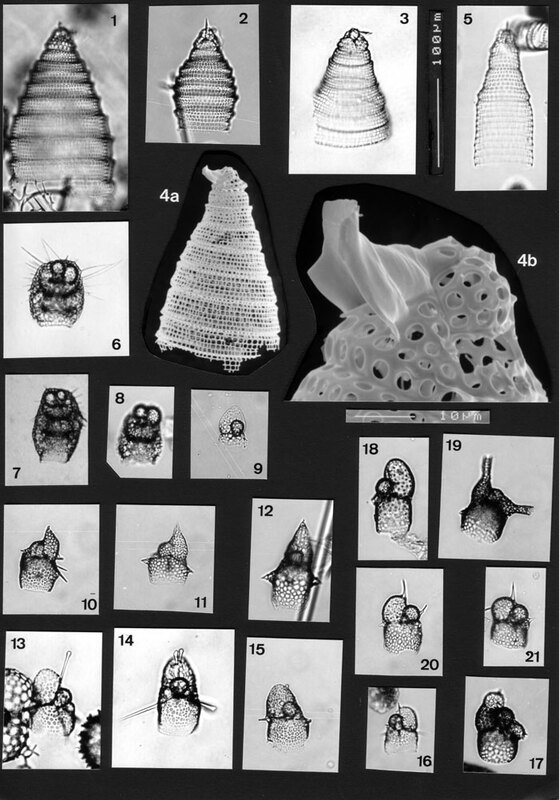 Note the extensive spongy outer covering and the long, thin spines of the specimens from the water samples (figs. 6 and 7) both lacking in the specimen taken from the surface sediment (fig. 8), presumably due to dissolution. Fig. 9. Botryopyle pithecus. BSS 34B(F) EF V35. Figs. 10-12. Botryopyle riedeli Nishimura. BSS 15B(F) EF E31, BSS 19B(F) EF U26 and BSS 11B(F) EF P48. Two lateral views and one frontal view. Fig. 13-16, 18. Botryopyle multicellaris All lateral views except fig. 14, frontal view. The typical drop-like spine termination may serve as a distinguishing characteristic. IOW 134(F); IOW 134(F); BSS 30B(F) EF P32; BSS 38B(F) EF H39; BSS 38B(F) EF F22. Fig. 17. Botryopyle dictyocephala. BSS 38B(F) EF H23. Fig. 19. Botryopyle disolenia. BSS 38B(F) EF S51. Figs. 20, 21. Botryopyle sp. cf. L. inflatum. BSS 61B(F) EF H33 and BSS 38B(F) EF F26.